The layout originally was famed as Wolf Hollow Country Club, birthplace of the Eastern Open and host of a half dozen other major tournaments. The course today is the same well-groomed test that confronted the golfing greats of the Golden Era of Sports. Golfers now tread in the footsteps of such immortals as Walter Hagen, Johnny Farrell, Gene Sarazen, MacDonald Smith, Willie MacFarland, and Leo Diegel. 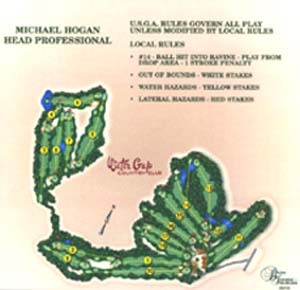 The 18-hole Championship layout offers a rare challenge to the golfer . 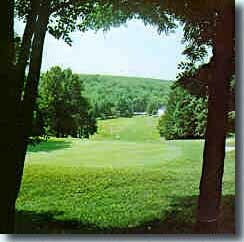 . . capitalizing on the natural features of some of the Poconos most picturesque terrain to present a truly challenging course. And going hand in hand, are a professionally staffed and well-stocked golf pro shop as well as a large fleet of superbly maintained golf carts. Terrain: Scenic, difficult course. Water hazards, sand bunkers. Hilly terrain. Turf: Greens: Poa Annua Grass, Fairways: Winter Rye.